Having a little time to spare while waiting for the fun event at the Lavapit last night I decided to take a look at the Zullay opening (besides I love a scavenger hunt). Arrival was not easy as the opening was popular and things did take a little while to rez, but once it did I saw a lovely location and of course a lot of people having a look around. The Poet Collection, The Glamour Collection, The Ethereal Collection, and The Haute Couture Collection. Each represents a specific style of clothing, hair and skins to allow our customers to shop according to their mood or desired look. ::The Poet Collection :: is a soft, romantic group of items created with soft colors and classic lines for a vintage feel. ::The Glamour Collection:: is modern and sophisticated, with bold colors and beautiful prints. ::The Ethereal Collection:: is a fantasy world filled with seductive mermaids, whimsical faeries and magical elves. Pictured here you can see me trying on the Glamour Iris set, the pants fit well with prim cuffs, the top is a delight with the prim draped back that matches perfectly - I often find prim additions although well conceived rarely 'work' this one did and I love it - a simple and chic daywear outfit - and it was FREE! 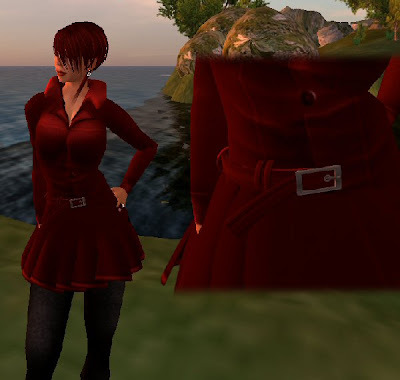 Wandering around I was drawn again and again to the Glamour coat, it comes in several colours but for me red will always be a favourite, when I first tried it on I found the prim skirt didn't fit me very well, although I haven't got a large avatar, but accidentally clicking it I found to my amazement it was scripted (that will teach me to read the notecards in the folder!) once re sized it was as stylish as I thought it would be with the detailing especially eye catching. This will definitely become a firm favourite of mine - although one little niggle is that with the prim collar worn on the chest I cannot wear any of my usual necklaces and anyone that knows me knows I always wear one of two that were gifts from James and the coat just does not look as good without the high prim collar. Another free gift I found was Sweet Fae from the Ethereal Collection This was well described as it is very sweet, the dress worn alone is absolutely lovely, Zullay Thor outdid herself with the gentle folds on the prim skirt of this dress with gentle blending of colours I would happily wear this as a cocktail dress. The wings accessorise it well and although I am wearing them as found with glow and full bright this can be modified for a less ethereal look. Overall I was impressed with the attention to detail and the soft look of the fabrics this is one designer who has got it right and worth keeping an eye on.